Will Mt. Vesuvius Erupt Soon? If there are the greater activities in the Vesuvius, or Pelée, then the southern coast of California – and the areas between Salt Lake and the southern portions of Nevada – may expect, within the three months following same, an inundation by the earthquakes. But these, as we find, are to be more in the southern than in the northern hemisphere. Mt. Vesuvius, located on the outskirts of Naples, Italy, last erupted in 1944. Its cone-shaped edifice is built within the very old caldera of Mt. Somma. The 18,000-year-old Mt. Somma caldera lies just east of another ancient caldera, Campi Flegrei. Thus, "the Vesuvius [realm?]" of the above reading comprises a highly volcanic portion of the Earth's crust. The word "realm" is enclosed in brackets to indicate a possible missing noun, one to go with the word "the' before "Vesuvius." Will any new eruption of Vesuvius display sufficiently "greater activities" to trigger the "within-three-months" warning of reading 270-35? This question will be addressed by first presenting an outstanding example of greater activities in the region, or "realm," of Vesuvius. Then, later in the article Hutton will refer to an eminent volcanologist's specific prediction of the window of time when he expects Vesuvius to erupt again. This Italian volcanologist has also predicted the type of eruption that he expects to occur. Fig. 1. Location of the restless caldera volcano, Campi Flegri, at Pozzuoli just west of Naples (Napoli). The impacts of the 79 A.D. eruption of Mt. Vesuvius are also shown, as modified from Fig. 4-3 of J. Boer and D. Saunders, 2002, Volcanoes in Human History, Princeton Univ. Press, 295 pp. On September 29, 1538, an eruption began in Campi Flegrei that in one week built a cone-shaped volcano, Mt. Nuovo. The eruption was preceded by a period of uplift in the area that ended a 1,400-year period of sinking. Residents of Pozzuoli, a coastal town some 15 miles from Vesuvius, first noted emergence of new land from places formerly occupied by the sea in 1502. By the early 1530s, this uplift was accompanied by unusual seismicity. In September 1538, earthquakes increased dramatically and a remarkable rising of the seafloor displaced the coastline by several hundred feet in the area just west of Pozzuoli. Some sources mention an uplift amounting to about 23 feet. On September 29, a crack opened in the area of maximum uplift. This newly opened vent began to emit vast amounts of pumice, fire, and black and white smoke. Ash from the initial activity fell over a wide area. The bulk of the new cone was built during the first 24 hours and, when first climbed on October 2, a "boiling" lava lake was observed within the crater. These observations provide a splendid historical record of "greater activities" in a volcanic area only 16 miles from Mt. Vesuvius; that is, in "the Vesuvius [realm]" of reading 270-35. And they also provide an example of "sinking or rising....in the Mediterranean area." Again, Mt. Nuovo is only 220 miles from Mt. Etna. Thus, vertical crustal movements at Campi Flegrei today can qualify as occurring "in the Mediterranean and Etna area." Well then, note the following. Two important episodes of ground-surface uplift occurred in the Pozzuoli area in 1970-1972 (+5.6 ft) and in 1982-1984 (+6.0 ft). Sinking of the land surface has occurred since the end of 1984. 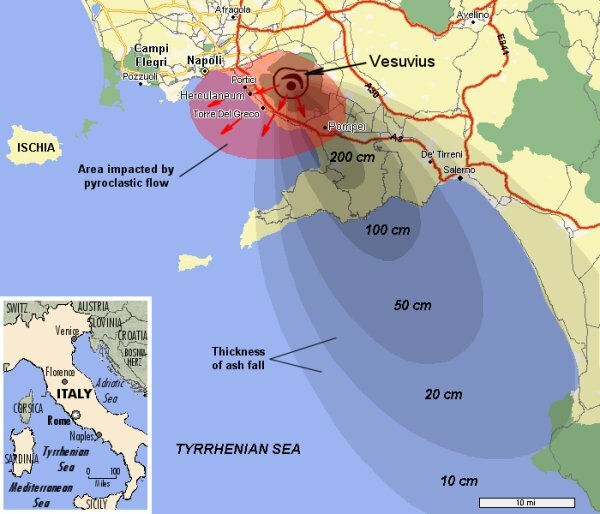 If something like the intensity of volcanic activity exemplified at Campi Flegrei in the 1530s were to be repeated in the Vesuvius area today, we could assume that earthquakes and inundations would strike portions of Utah, Nevada, and coastal southern California within three-months' time. Recently, seismicity at Vesuvius during 1995 and 1996 was the strongest in the last 50 years. This indicates movement of subsurface magma. And at Campi Flegrei, increased temperatures have been noticed at vapor-emitting vents. We continue to watch and wait for increased activities at Mt. Vesuvius proper, or in the Vesuvius area, if that's the way that "the Vesuvius" is to be interpreted. The last great Plinian eruption1 of Vesuvius took place in 79 A.D., when surges of mixed hot gases, ash, and pumice (pyroclastic flows) entombed the towns of Pompeii and Herculaneum. How close is an eruption of Vesuvius and what will be the nature of that eruption? We begin with a couple of news stories on the awakening of the volcano. The PBS Nova broadcast of November 10, 1998. Here follows a brief resume of the program, made from notes that I took at the time. "We don't know when it will occur, but the next eruption of Vesuvius may well be immense, violent, and explosive." This according to the PBS broadcast on NOVA for November 10, 1998. It seems that a team of scientists making a geophysical image of the core of the volcano found that the passageway between the magma chamber and the crater – called the "conduit" -- is blocked by a rock plug. This is a dangerous situation that can result in a violent eruption, as opposed to a non-explosive, lava-flow eruption, as last occurred in 1944. Vesuvius has been dormant since then. As to the timing of the new eruption, there are recent indications from gas-emitting vents in Vesuvius's crater, that a large, hot magma chamber lies below the mountain. And micro-earthquakes indicate that the magma is beginning to move about. Although there is no indication that an eruption is imminent, the Italian government is working on evacuation plans for some 650,000 people who live in "death zones" surrounding the volcano. This Nova program was a bit too dramatic for my taste. It is true, however, that a massive magma layer feeds Mt. Vesuvius and Campi Flegri. As reported in a press release for an article in the journal Science (11/16/2001), P. Gasparini of the University of Naples said, "This [geophysical survey of the Vesuvius area] tells us that there is a huge amount of available magma under Vesuvius. It was really unexpected for the reservoir to be that size, so very wide and large. It underlies a very large area under the Neopolitan volcanoes." Although Mt. Vesuvius's next eruption will probably be explosive, coming on the heels of a long quiet period, don't expect the magma reservoir to be drained. Most volcano experts believe that no more than 20 to 25 percent of available magma is released during any eruption, says Gasparini. The July 1, 2002 Newsweek article. An article by Barbie Nadea in Newsweek magazine piques our interest. Here are the relevant excerpts from Nadeau's "Trouble in the Mountain: Scientists Warning for Mt. Vesuvius Volcano." In the towns and villages that dot the side of Mount Vesuvius, the volcano that buried the ancient Roman cities of Pompeii and Herculaneum, life seems normal enough, except there's expectation in the air. Ugo Corati, who has lived and worked on the mountain all his life, was 12 years old when it erupted, in 1944. It was a bad time. A slow stream of lava destroyed 800 homes and the villages of San Sebastiano and Massa di Somma, and killed a few dozen people. Since then, scientists have installed all sorts of fancy equipment to monitor the mountain for signs of trouble, and local authorities regularly sound sirens and lead evacuation drills. Corati, sippingespresso in a local cafe,doesn't seem at all reassured by this activity, but neither is he particularly troubled by the danger. "What can you do about it?" he says with a shrug. "All these safety measures and all this monitoring equipment are in place, but if the mountain goes, we're all as good as dead." A chilling assessment, and it gets chillier. Earlier this month volcanologists said the mountain was beginning a new cycle of volcanic activity that could trigger an eruption "at any time." [Hutton emphasis added]. And this one will be nothing like the slow dribble of lava in 1944, they predict; it will be the biggest explosion in 2,000 years. The news is not good for the 2 million people who live and work within sight of the crater. The area around Mount Vesuvius is the world's most densely populated volcanic region. A big eruption could kill a million people in minutes, says Edoardo Del Pezzo, research professor with the Vesuvius Observatory in Naples. "We expect that a wide area could be destroyed in a few minutes." This scenario sounds frighteningly similar to A.D. 79. Twenty thousand residents of Pompeii and Herculaneum thrived on the mountain's unusually rich soil, which they probablyattributed to the blessings of Fauna, the goddess of farming and fertility. In August of that year the gods got ugly. Wells dried up, mountain streams stood still, birds and dogs went silent, the ground rumbled. One day hot gases, ash and pumice shot 30 kilometers into the sky. 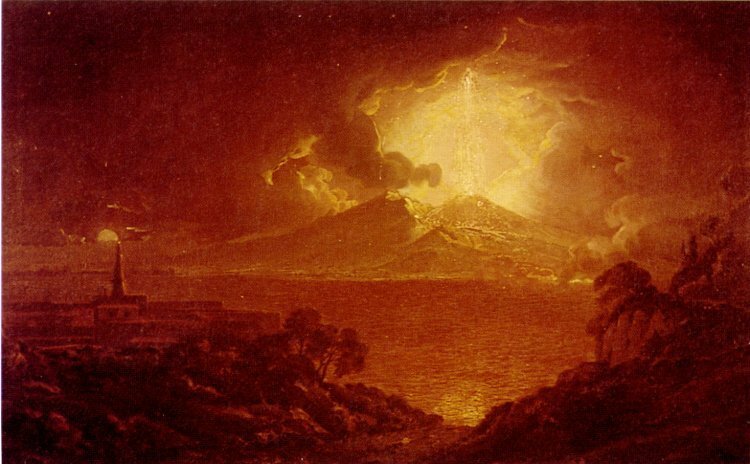 Ash rained down on Pompeii at the rate of six inches per hour, and then came the lava. In 1961, archeologists unearthed impressions of ancient Romans buried alive while trying to flee the mountain, their mouths agape and arms extended in poses of desperation. Mount Vesuvius continued to erupt every hundred years or so until 1037, when a 600-year lull ensued, followed by a sudden eruption in 1631 that killed 4,000 people. It also kicked off a new cycle of eruptions, 21 in all, that ended in 1944. Despite constant monitoring since then, scientists didn't detect trouble until Gabriele Paparo, a geologist with the National Research Council, finished a three-year study this summer. Vesuvius' last eruption was relatively gentle because it was driven mainly by hot molten rock, or magma, percolating up from beneath the earth's crust and causing slow-moving lava flows. Paparo found a more disturbing development: gases building up beneath the mountain are setting the stage for a much more violent eruption. As the ground gets hotter from volcanic activity, it swells, compressing the gases that fill up the cracks. The tidal pull from the sun and moon raises and lowers the water table, increasing the pressure further. Eventually, the mountain's lava plug will blow. Del Pezzo expects the eruption to be about one fifth as powerful as the one that devastated Pompeii—though big enough to destroy a seven-kilometer ring around the crater within 15 minutes. Will residents get caught by surprise? Not if the scientists can help it. They are using radar satellites to monitor subtle swellings of the ground. They've slipped fluid-filled cylinders into cracks and holes to measure stresses and strains. They've put out seismic antennas to pick up the slightest tremors and a new artificial nose to sniff gases emanating from fissures in the ground. They're looking for "anomalies"—any sudden change that might signal an eruption in progress. Del Pezzo expects to see such "precursor phenomena" a month or so before a big eruption. Once Observatory scientists notify the civil authorities, "a government commission evaluates the situation, and gives the alert," he says. I don't trust most media journalists who write about scientific matters based upon interviews with scientists. Professor Del Pezzo, apparently one of the main sources of the article in Newsweek above, wrote a paper on Vesuvius with three others in 2002. He is, therefore, a credible volcanologist. But his assertion about the size of the next eruption must either have been made up by Barbie Nadeau, or extracted from the professor after plying him with a couple of bottles of Italian fine wine. To get the latest on Vesuvius's eruption potential I wrote to two other top specialists on Vesuvius. One of these was Gabriele Paparo, mentioned in the article above as finding "a more disturbing development: gases building up beneath the mountain are setting the stage for a much more violent eruption. As the ground gets hotter from volcanic activity, it swells, compressing the gases that fill up the cracks." The volcanologists' combined reply to me indicated, however, that they had only recognized that sources of ultrasound emissions that they had measured on a lava outcrop revealed a 3D distribution of hot fluids diffusing into pores underground. "Indeed," they wrote in their joint reply to me, "our recorded phenomena are incompatible with the assumption of a magma pluton" [at depth] because magma "cannot propagate into pores, it only causes cracks" [in the host rocks]. Now how in the world do these words translate into Nadeau's "gases building up beneath the mountain [that] are setting the stage for a much more violent eruption. "The other of the two volcanologists who replied to me was Giovanni Gregori. Among many other things volcanological, Dr. Gregori is known for his studies of the cycles of eruptions at Vesuvius.2 He tells me that if the eruption cycles he has identified do not break down, he can predict that one can expect a sub-Plinian eruption to occur sometime between A.D. 2015-2029. This is an important scientific prediction because, as stated at the outset of this article, the question for Americans is, "Will any new eruption of Vesuvius display sufficiently "greater activities" to trigger the warning of reading 270-35: "If there are greater activities in the Vesuvius, or Pelée, then..."
A sub-Plinian eruption would erupt about 0.1 cubic kilometers. Four such eruptions are reported for historical times. The last one occurred in A.D. 1631 and killed about 4,000 to 10,000 people. Various eruption precursor phenomena were reported a few months in advance. By contrast, a Plinian eruption, like the one that destroyed Pompeii in 79 A.D., produced an eruption of solid matter over 1 cubic kilometer in volume. Plinian and sub-Plinian eruptions are believed by most volcanologists to last over periods of about 30 hours, not the few minutes often reported in some numerical models. In any case, there is no time for effective evacuation of nearby residents. High level of volcanic activity continues at Kilauea Volcano in Hawaii. On Wednesday 3rd March 2004, the south wall of Pu`u `O`o crater partly collapsed, and fell into the crater. The crater is full of incandescent vents. A 3km long lava flow moved south of Pu`u `O`o crater reached 2150-foot elevation, and there are many areas of lava breakouts. The lava flows are in a remote part of the east rift zone, difficult to reach by foot, but are more easily observed from the air. The current lava flow is the furtherest from the vent since last October. As of the 2nd of March, the Hawaiian Volcano Observatory (HVO) has reported that a calm morning finds no change at Mauna Loa. Inflation is continuing at the summit, where the GPS network first showed definite lengthening of the lines across the summit caldera in late April or May 2002, after nearly 10 years of slight deflation. The summit expansion tailed off and perhaps stopped in mid-winter 2002-2003. It then resumed, starting on about February 15, slackened, and once more began in late April or early May. The lengthening again slowed during the summer but accelerated as summer ended. We interpret the lengthening, uplift, and tilting to indicate resumed swelling of the magma reservoir within the volcano. Seismicity, however, remains low. As for Mt. Pelée on Martinique, there is no new information to indicate that this important volcano is other than dormant. A Plinian eruption is an explosive eruption in which a steady, turbulent stream of fragmented magma and magmatic gas is released at high velocity from a vent. Large volumes of ash and tall eruption columns are characteristic. Etymology: After Pliny the Younger, who witnessed the destruction of Pompeii in 79 A.D.
cf. Gregori, G.P., 1993, "The next eruption of Somma-Vesuvius." Invited paper in The Earth and the Universe, Festchrift in honour of Prof. Jans-Jurgen Treder, Ed. By Wilfred Schroder, pp. 191-213, Bremen, Science Edition.